Serving Colorado with Promotional Ad Marketing Products since 1995. 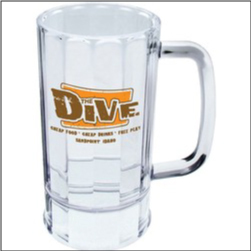 Order imprinted Custom 14oz Beer Mugs – perfect for beer festival events and more. These brew mugs feature a thick fluted base, and are made of BPA free, FDA approved clear styrene plastic – ideal for indoor and outdoor use. Dishwasher safe. We also have many many other beer mugs and steins available, just ask! © Colorado Promotion All Rights Reserved.